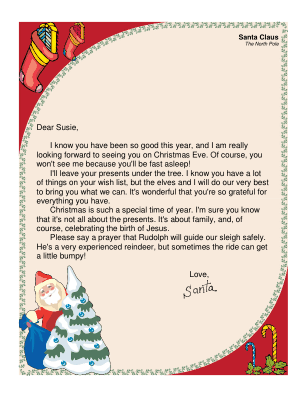 This printable letter from Santa is intended for Christian families and mentions the birth of Jesus and asks for a prayer that Rudolph guides Santa's sleigh safely. I know you have been so good this year, and I am really looking forward to seeing you on Christmas Eve. Of course, you won't see me because you'll be fast asleep! I'll leave your presents under the tree. I know you have a lot of things on your wish list, but the elves and I will do our very best to bring you what we can. It's wonderful that you're so grateful for everything you have. Christmas is such a special time of year. I'm sure you know that it's not all about the presents. It's about family, and, of course, celebrating the birth of Jesus. Please say a prayer that Rudolph will guide our sleigh safely. He's a very experienced reindeer, but sometimes the ride can get a little bumpy!